The Forcefield Pro Sub 4 is claimed to be the first motorcycle back protector in the world that transmits less than 4 kN of force in the EN 1621-2:2003 standard testing regime. This is below the “magic” number of 4 kN, said to be the maximum force that should be transmitted to the back and rib cage. It is also less than 1/2 the 9 kN force maximum for current EN Level 2 protective equipment. That’s all well and good, but if the Forcefield Pro Sub 4 wasn’t comfortable, it wouldn’t get used, and if it didn’t get used, the amount of force it transmits would be moot. I’m happy to report that not only is the Forcefield Pro Sub 4 probably the most comfortable back protector we’ve reviewed. It also weighs a full 227 grams (1/2 pound) less than the svelte Knox Ricochet, a remarkable achievement. 4 kilo-Newtons (4 kN) is the magic number for back protectors. Even though the prEN 1621-2 standard of 2003, which is the current benchmark for motorcycle back protectors, calls for no greater than 9 kN transmitted during the standard test, lower is better in this game. Forcefield has really taken the lead on motorcycle back protector technology with the Pro Sub 4, which is the first to transmit less than 4 kN in the standard Level 2 test; 3.38 kN actually, according to SATRA tests. Now I’ve heard that there may be some equestrian back protectors that transmit less than 4 kN. For example, the Level 3 “Purple” grade protectors are claimed to transmit the least amount of force in the British Equestrian Trade Association (BETA) 2000 tests. That test is equivalent to prEN 13158:2000, but even the BETA website itself doesn’t explain the testing regime, nor can I find any data on how much force is actually transmitted in a Level 1, 2 or 3 protector . But that’s neither here nor there, because horseback riding is a very different sport than motorcycling and equestrian back protectors are not compatible, for a variety of reasons. So my advice is to forget the equestrian vests and stick with a known entity like Forcefield, who specializes in motorcycle rider protection. 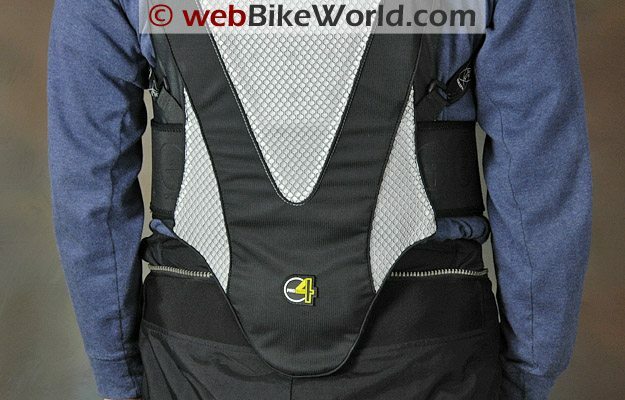 Forcefield Pro Sub 4 back protector. Outside (L) and side facing rider’s back (R). Lower portion of the Forcefield Pro Sub 4 back protector. 4 kN is not an easy number to beat; the old Level 1 standard allowed up to 18 kN to be transmitted, and although you may still find some of those on dealers’ shelves, they are not recommended (although it is possible that some back protection is better than nothing). Getting the industry to agree on the Level 2 standard of no more than 9 kN was apparently not easy , and many companies charged a premium for back protectors meeting Level 2, which is now the de facto minimum. So with the Forcefield Pro Sub 4 — a comfortable, lightweight back protector now available that has been tested to transmit less than 4 kN — why mess around with the rest? Here’s the way I look at it: a motorcyclist interested in wearing a back protector is by definition interested in safety. 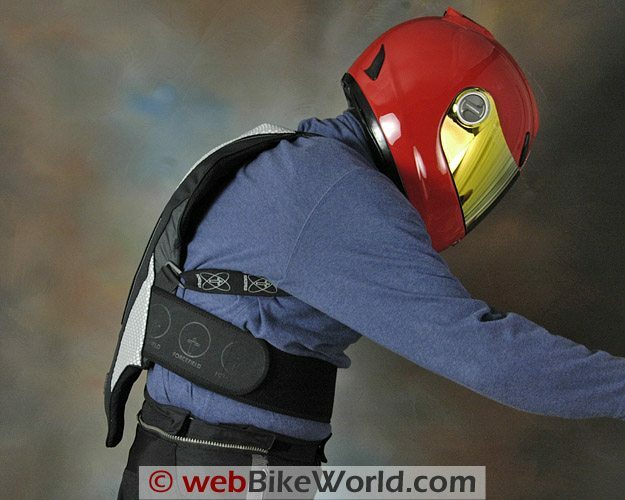 So as long as the rider is going to wear a back protector anyway (recommended), said rider may as well wear the protector that transmits the least amount of energy. So what’s 4 kN? This is where it gets a bit tricky. 4 kN is about 900 pound-force, and a pound-force is “a unit of force equal to a mass of one avoirdupois pound times a standard acceleration of gravity, equal to about 4.44822 Newtons” ). So even 4 kN is a lot of force; after all, this is your back and spinal cord we’re talking about. Even if you don’t understand the physics of it (and I’ll be the first to confess that I don’t), it’s pretty obvious that less is better. The real kicker here is this: if the protector wasn’t comfortable, who’d want to wear it? I firmly believe that is the case with most of the back protectors on the market. I will also confess that I don’t regularly wear one — or haven’t until now — because most of them are just too uncomfortable. But Forcefield went genius on this one, because Pro Sub 4 is actually more comfortable than any other back protector we have hanging around here — and we have about 5 completely different types just now. They hang there collecting dust because no one wants to wear them. Now it does take a bit of effort to become used to wearing a motorcycle back protector on a regular basis for simple street riding. But, like a helmet (or jacket or pants or boots or gloves…), once you get used to it, you feel totally vulnerable without it. Granted, it takes a lot of time to get suited up properly to begin with — it would be so much easier to simply crawl on the bike in those shorts and T-shirt, right? But throwing on a back protector is probably the easiest and quickest part of the routine. Burn and I timed ourselves, and even at a leisurely pace, it takes less than 15 seconds to take the Forcefield Pro Sub 4 from the hangar to the back, firmly secured, locked and loaded and ready to go. Forcefield Pro Sub 4 (Top) compared to Knox Ricochet, side view. Forcefield Pro Sub 4 on the left in each photo, compared to the Knox Ricochet for comparison purposes. We took a few photos comparing the size and thickness of the Pro Sub 4 vs. the Knox Ricochet, just for illustrative kicks. 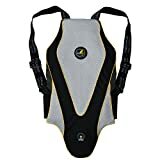 We have nothing against the Knox product, but the Ricochet was (it’s now slightly outdated) a widely available back protector that is thin and fairly light. Ours is labeled as meeting Level 2, but it’s curious to note that we can no longer find much reference to the standards met by the Ricochet. It’s still available for sale at some retailers, but it seems to have been superseded by newer Knox designs. The Ricochet was one of the thinnest back protectors available though, but thin doesn’t necessarily mean comfort. It is comprised of a series of “boards” across the back, but it seems rather stiff, especially in the lateral plane. 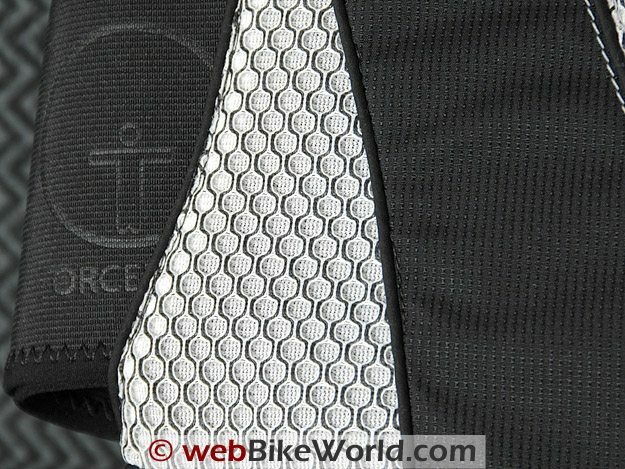 The Forcefield Pro Sub 4 is much thicker, at about 50 mm (2″), but it doesn’t seem to make much of a difference under motorcycle jackets, as long as they have a normal fit (but with their existing internal back padding or protector removed). Close-up of fabric and stitching on the Forcefield Pro Sub 4. 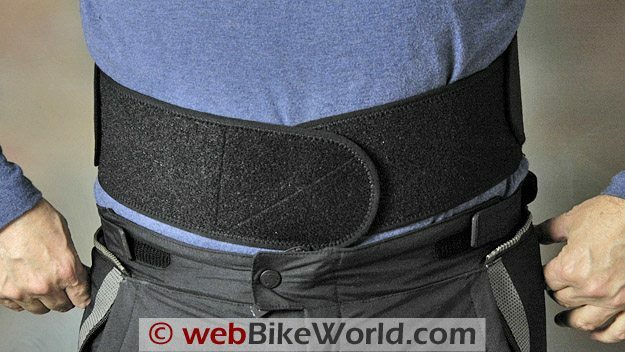 Forcefield Pro Sub 4 waist belt. The Pro Sub 4 is also cut differently, which actually helps make it more comfortable. It is cut or tapered up by the shoulders, compared to the wider fit of the Ricochet in that area. This gives the Pro Sub 4 a better, snugger fit. The neck also feels like it’s cut slightly lower and the material is tapered, which minimizes the interference in a sportbike tuck. That is, the lower rear section of the helmet doesn’t bump up against the top of the back protector, which can happen with some back protectors like the BMW version we reviewed. 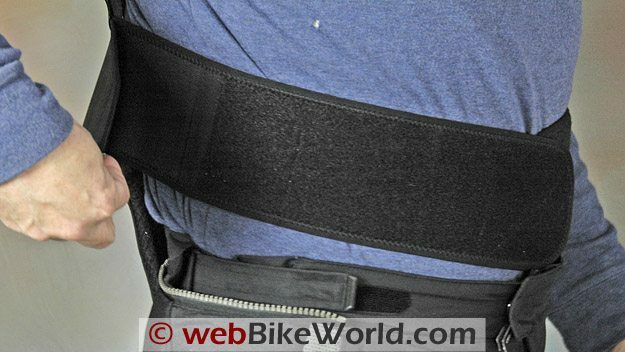 The Pro Sub 4 sort of blends out at the sides, and it includes soft “wings” that cover a portion of the lower rib cage and which help protect the waist belt from chafing. The build quality of the Forcefield Pro Sub 4 is very excellent; it looks and feels modern, sleek and high-tech and the materials are just as good — even the belt, the suspenders and the fabric covering. I’m sure the impact-protecting internals are top-secret, but it feels like some type of stiff “memory foam” material. I can squish it between my fingers and it compresses slightly. The large majority of the protector is made from this stuff, but it’s also covered with a softer, squishier material at the tail bone and the lower rib cage protector “wings” in the back and other areas. 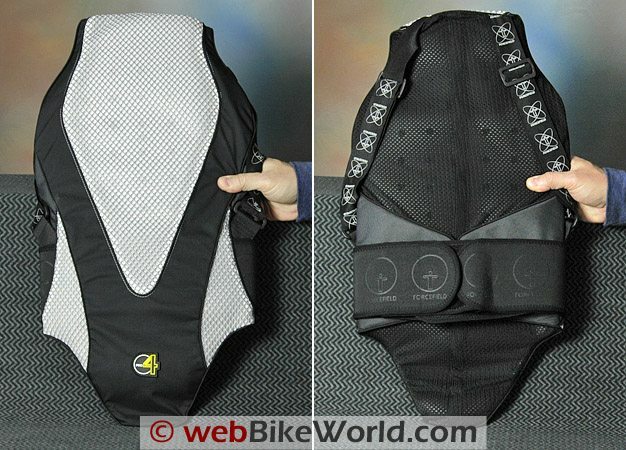 The entire body of the protector has large holes for ventilation, and the fabric is perforated on the back side where it rests against the rider and the white honeycomb material on the outside is a different type of mesh. The fabric covering supposedly can be removed for cleaning, but I haven’t tried this. The belt on this size medium would probably fit a maximum of a 39-40″ waist. It is attached with a relatively stiff elastic where it meets the main part of the protector, and there are two separate short belt sections that attach to the belt via hook-and-loop. I first secure the belt around my waist, then undo the shorter sections and pull them slightly forward around my waist to make sure they pull the protector into position. The suspenders are made from elastic and fully adjustable, so no problems there. The Pro Sub 4 does not have a horizontal connector for the chest straps (suspenders). The shock-absorbing material actually feels like it gets more pliable as it becomes warmer with my body heat, which helps mold the protector to my back. This also adds comfort to the Pro Sub 4, because it doesn’t have any of those hard points found in other type of protectors, some of which feel like you’re strapping a piece of plywood to your back. The size medium feels slightly short for my 5’10” frame (178 cm), and I wish the tail section was a bit longer, but otherwise it’s perfect. After viewing the photos posted here, Forcefield sent a note suggesting that I may be wearing the straps too tight. However, I tried loosening the straps all the way but it didn’t make much of a difference, because the elastic keeps the protector snug. Forcefield also suggested I may be on the borderline for a size M.
Now I have not had the misfortune of being able to test the protective capabilities of the Forcefield Pro Sub 4 in real life, so like other types of motorcycle gear, we can only go by what the standards boffins tell us is good. But this is the back protector to have — until someone comes out with a lighter, more protective version that is. And I’ll bet that if anyone can do it, it will be Forcefield! Editor’s Note: We received a few emails asking about back protector penetration. A couple of people sent us a link to a photo of an older Forcefield Level 1 back protector that had been jammed over a foot peg, which is shown protruding through the protector. Besides the fact that this is obviously not a scientifically valid test and we have no idea how much force was used, a foot peg landing penetration is such a rare event that this type of testing is not even included in the ECE standard testing scheme. 1) Is this indeed a genuine Forcefield protector and not a counterfeit? It’s not always easy to tell. 2) Taking one sample and punching it on to a foot peg or with a hammer probably does not duplicate the extensive certified testing that these garments go through. For example, how much force was used? Was it measured? Did it meet the testing standards? 3) Did he contact Forcefield to ask about the standard for foot peg or small puncture force dispersion? 4) Is this a Level 1 or 2 protector? Level 1 protectors are now obsolete. I’m not saying the results the rider encountered are good or bad. What I am saying is that there are many different factors to consider, and pushing a back protector on to a foot peg with an indeterminable amount of force is far different than meeting a CE standard, which, in the end, is the only thing we can use to compare. It is possible that the back protector shown was never designed to withstand the force used in that example, nor were the standards, and that the protectors are designed to dissipate forces out over greater areas. Indeed, I would guess that having a bike land on a rider exactly in a way that the foot peg comes down perpendicular to the rider’s back with enough force to penetrate the back protector is an extremely rare occurrence compared to all the other ways in which a back protector can help protect a rider. In any case, I’m never fond of these single example photos that may or may not be telling the entire story. That’s why I would suggest that the rider contact Forcefield to ask about withstanding those types of forces, which is what I will do also. “The back insert (in that photos) is identical to the Joe Rocket Level 1 we have supplied to them in the past. But as mentioned by (webBikeWorld) the picture does have issues. For instance the back insert would never be used on its own. It is designed to be used within suitable motorcycle clothing such as textile or leather; both of these would have to be penetrated also. In 13 years, we have never been aware of any incidences where the foot peg has penetrated through one of our back or limb protectors in real-life circumstances. This is testimony to the quality of our products but more significantly because of the rarity of the foot peg striking the back protector. This probably explains why it isn’t an integral part of the European standard. EN1621-1 doesn’t specifically relate to foot peg penetration. The rounded face bar impactor size is 80 x 40mm with a 12.5mm radius face and is a test against blunt impacts such as kerbstones or road surfaces. This has a mass of 5 kgs. The 150mm domed anvil over which the protector is located before being impacted by the bar is supposed to replicate the riders back. The product should not transmit more than 18 KiloNewtons of transmitted force to achieve level 1 and meet the requirements of the CE. This is the minimum requirement that the product has to perform to. When the product is impacted in the accredited test houses there should be no penetration when the impactor strikes the protector. If there was any penetration then the product would surely fail because it will have not absorbed the required levels of transmitted force. The standard takes into account protection, comfort and ergonomic requirements and is by no means perfect. Our products pass the required tests as can be proven by the accredited authorities. Products however conforming to the European standard reduce the incidence and severity of injuries. What authentic CE protectors do is provide the user with the knowledge that some care has been taken over the development of the protector and it has been authenticated by an accredited body. Those products that have no authentic mark could be and as we know from experience are more than likely offering little or no protection. But it is a benchmark albeit far from perfect that is there to assist the consumer in his choice of product he wished to purchase. I don’t believe under normal circumstances that any of our back protectors would be penetrated. Of course in an extreme or unfortunate situation this cannot be ruled out — but the same can be said of a so called hard shell protector or any other item for that matter. They are there to minimise and are not a 100% guarantee. Hence generally CE protector user information imply that products meeting the requirements of the technical specifications are intended to reduce the severity or incidence of soft tissue injuries such as bruising, contusions, cuts and abrasions. The feedback and endorsements we have suggest that our products are capable of providing more than this. From “J.W.” (6/09): “Regarding the physics involved, I think can shed a little light on the matter, but keep in mind I am not a physicist. Basically, for testing both back protectors as well as shoulder and elbow protectors, a test apparatus is used with an impactor and anvil configuration where you lay the piece of armor on the anvil and drop the impactor, a 5 kg mass, from a certain height, which I would think varies depending upon the thickness of the armor as the impact is required to be 50 Joules. Now a different shaped anvil and impactor are used for back protectors vs. shoulder and elbow armor, but both impactors and anvils have radiused or rounded ends resulting in a relatively small striking point. So using the formula of 1 kN = 1,000 J/m and assuming a rather small impact surface of about a millimeter (remember, the anvils and impactors are rounded at their ends), and do remember that a mm is .001 M, a 50 J impact roughly equates to 50 kN unprotected on the test apparatus. Obviously there will be variations and random energy loss due to friction, etc. which is why they take an average over 9 impacts. So in effect, a level 1 certified back protector, allowing no more than an average of 18 kN transferred over 9 hits with no impact to exceed 24 kN is essentially cutting the impact in half. For level 2, it must average 9 kN with no impact exceeding 12 kN. So with a level 2, we’re looking at cutting the impact by about 80%. That’s pretty huge. I also read (though I only saw it in brief from an unverified source, a more in depth search might be in order) that the medical recommended limit should be 4 kN. Perhaps this is where Forcefield got this number to target. Either way, it’s a huge achievement as we’re now looking at a protector that can on average dampen 92% of a given impact. Though more importantly, Roderick Wood, the man more or less behind the EN certification process (his studies of motorcycle accident injuries created the basis for what eventually became the standard) has been quoted as saying (though I’d love to have a direct quote, I haven’t been able to find one without purchasing his full study as an abstract) that the majority of spinal injuries in motorcycle accidents are caused by hits to the shoulders and elbows where the spine is tweaked or over-extended. A back protector will not help here. But it will help from cracking your vertebrae on the cement or breaking/bruising ribs, etc. So I’ll be wearing mine. Editor’s Reply: Thanks for the detailed feedback, I believe you are correct, see the links referenced in the beginning of the article above for more detailed information, especially the PVA PPE standards page referenced in the number 2 above, which has a lot of detail on the testing and history of personal protective equipment (PPE). From “M.G.” (6/09): “I just came across your article about Forcefield’s new back protector and I’m glad I did. I have been wearing the Forcefield Back Protector TPro (review) based on reviews I had read on your site. I fractured my spine in a motorcycle accident 2 years ago and actually got lucky that I wasn’t paralyzed. With that in mind I always wear a back protector when I ride and I’m always searching for something better (meaning transfers less force). I’ll probably pick up the Pro Sub 4 within the week.